It was a normal day for this herd of elephants. That is, until the littlest member of the family got into a bit of trouble. Like a child riding a bike with no training wheels for the first time, this little guy took one step too larger, and it landed him in an awkward position on his back, rendering him unable to move. The darling moment was filmed at the Zurich Zoo in 2014, according to bluekoo T.'s YouTube description. Although, as Last Chance for Animals notes, changes in the elephants' normal behaviour have been noticed in elephants that live in captivity, the mother-calf bond seems too strong to be broken. The family and social bond structure of elephants is actually one of a kind and has been compared to the human one. Behaviours such as grieving for lost family members have been reported often, Animal Corner explains: "They have been known to express their sadness over a stillborn baby elephant. The obvious expressions of the mother's face, her sad eyes, drooping ears are a tell-tale sign of an elephant grieving." Another very interesting trait of elephants is how attentive mothers can be. The mother will closely watch her calves and are known for even guiding them by gripping their tails, San Diego Zoo Library explains. That the other elephants come to the mother's aid shouldn't come as a surprise either. "Female elephants have very strong social bonds and live in matriarchal families," Asian Elephant says. For example, "during the birth of a calf the members of the herd will gather around to help the mother." "The whole herd will constantly protect the young from dangers along the way," Animal Corner adds. As you'll see in the video below, after the calf stumbles and falls, it doesn't take long for Mom & co. to come to the rescue. 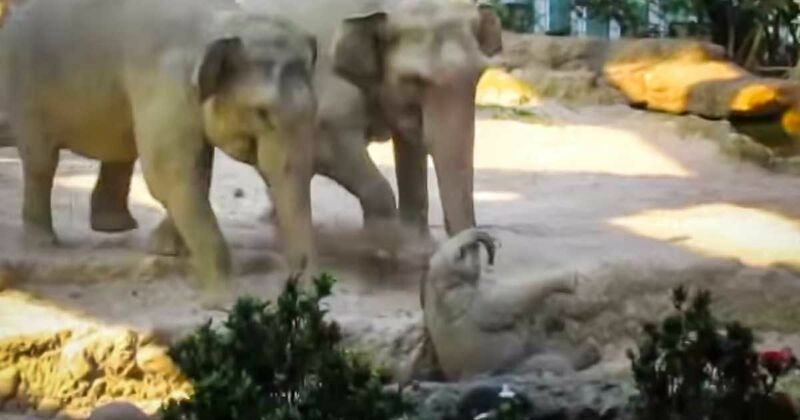 What they do may be pretty common among elephants, but watching it happen is pretty unbelievable.